Campaigns are tracking tools that let you categorize donations and link them to specific appeals. Appeals are fundraising communications or events used to solicit donations. An appeal might be anything from a "Remember to Give" postcard to a fundraising golf tournament. You can link donations to campaigns and individual appeals, which can give you insight into what approaches work—or don't—when it comes to fundraising. Start by going to Donations > Campaigns. Enter the goal amount—how much do you hope to raise with this campaign? Enter the deadline—by what date do you hope to have reached your goal? Typically, you'll leave the status set to Active. An Inactive campaign can't be linked to any new donations. If you need to edit any of the campaign's details, click and make your changes. Delete the campaign by clicking . After creating the campaign, click its name to go to its page. After the campaign is underway, the campaign page will show you donation and appeal statistics. At this point, you'll see where you can add Appeals and Online Donation Pages. 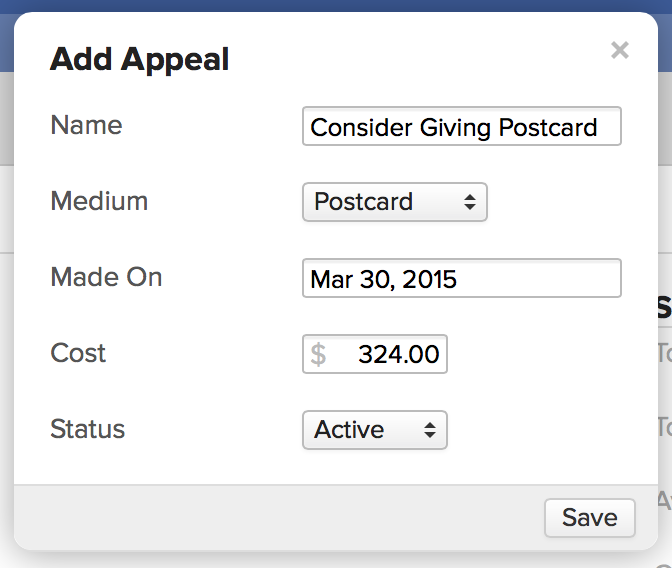 Appeals let you track how well specific fundraising approaches work when soliciting donations. For example, you might send out a "Consider Giving" postcard with a link to an online donation page and your mailing address; at the same time you send out an email with the same message and a link only to the donation page. As the donations roll in, you can link each donation to one or the other of these appeals. You might then learn that the email campaign, while much cheaper and more engaging than the postcard campaign, netted you less in donations than the postcard campaign—which helped you land several large donations mailed to your school. Click add next to Appeals. Give the appeal a name. It's best to distinguish similar appeals with descriptive names. For example, you'd name the appeals in the above example the Consider Giving Postcard and the Consider Giving Email. Choose the appropriate appeal medium—those are set up in Donations > Settings. Enter the date on which you made the appeal... say, when you clicked Send on the email or when you hit the links for the golf tournament. Enter the cost; this will help you calculate your ROI. Presumably, you'll leave the status set to Active; an inactive appeal can't be linked to new donations. If you've enabled online donations, you can now connect online donation pages to your appeal. When you add a donation page to a campaign, that lets you automatically connect any donations received through that page to this campaign (and even individual appeals). You can add as many pages as you wish to your campaign; this means you can (and probably should) create a unique page for each appeal you've created. Start by clicking add next to Online Donation Pages. Read more about setting up pages here. You'll incorporate links to your online donation pages in various emails and announcements; since these are tied to your campaign and appeals, online donations will automatically be connected with them. Use the time period filters to review donations made during particular timeframes (donations this year, donations last month, etc. Filter the Donations report to show donations connected to the campaign and its appeals—among many other possibilities. Filter the Donors report to show Donors with donations connected to your campaign and its appeals; you then have options to email them, tag them, and print mailing labels and envelopes... among other things! 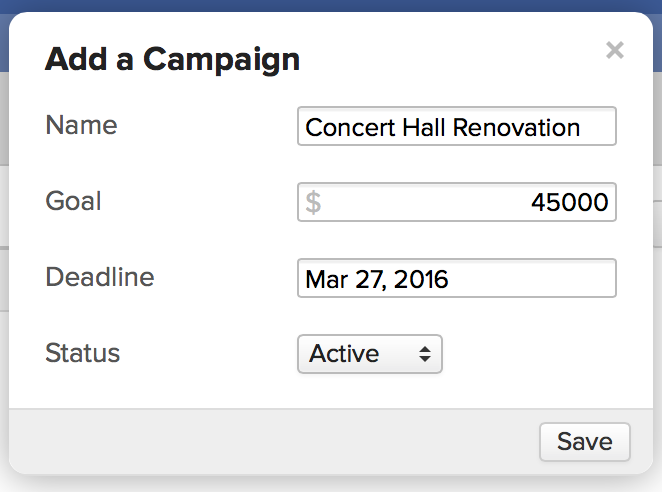 As you plan and execute new appeals, you'll add new appeals and donation pages to the campaign. Keep an eye on the ROI field in the campaign summary panel. ROI is calculated thusly: Total Donations - Total Cost of all appeals divided by Total Cost. If you've raised $10,000 on a campaign with three appeals totaling $500 in costs, your ROI would be... 10000 - 500 = 9,500 ÷ 500 = $19 ROI. That is, for every dollar you spent on the campaign, you yielded $19 in donations.